A go-anywhere jet vac tanker designed for use by the military and United Nations relief teams is proving its worth helping keep sewers running smoothly across central and southern England. The JHL recycling jet vac tanker is being used by Lanes Group plc to access remote sewers and culverts across the most difficult terrain on behalf of Thames Water. Lanes, Thames Water’s wastewater network services maintenance partner, is using the specialist vehicle for more productive planned cleaning of main sewers and to respond rapidly to off-road blockages. Michael Hall, Head of Operations for Lanes Utilities, said: “Our 8×8 jet vac tanker is the only vehicle of its kind operating in the UK, and it’s all-terrain capability is proving its worth time and again. The vehicle has enhanced ground clearance plus eight-wheel drive and steering. It was originally designed to support wastewater management in remote military bases and humanitarian aid camps. Two Lanes drainage engineers have now undergone specialist off-road training in the vehicle to support their work in some of the most remote and hard-to-reach locations across the Thames Water region. The training has taught them how to make the best use of the jet vac tanker’s ability to cope with boggy and unstable ground and risk assess conditions to ensure all off-road hazards are fully considered. 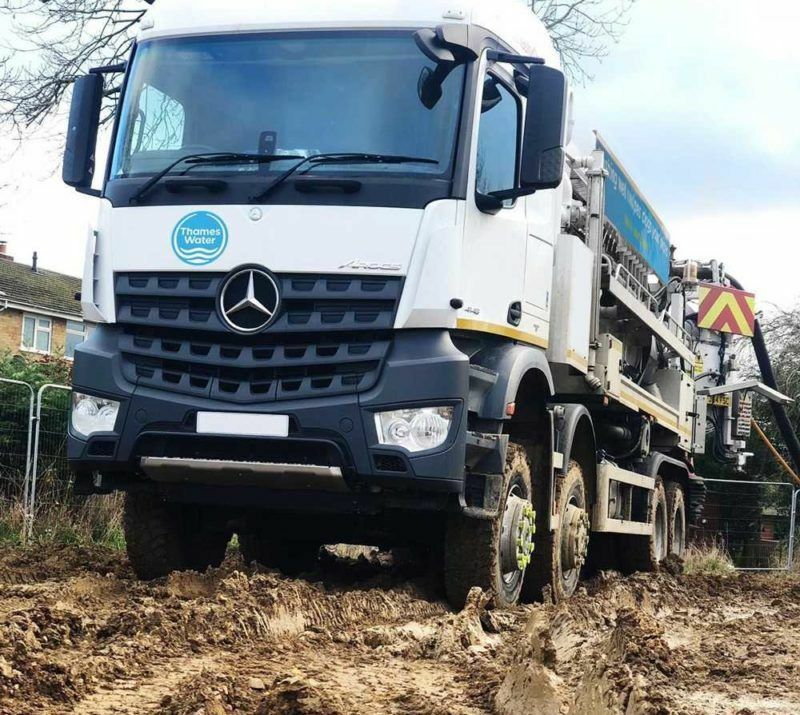 In Long Hanborough, in Oxfordshire, the vehicle has been used to travel 1,000 metres across farm and construction land that had been churned up by excavators to carry out a large sewer clean. Without the JHL 8×8, the project could only have been completed with a recycler jet vac tanker, two tracked portable jetting reels and the deployment of a confined space entry team. Jet vac operative Chris Wood, who is the vehicle’s main driver, said: “This is an extraordinary piece it kit. It makes our off-road work much more productive and allows us to react more quickly to potential pollution incidents. “Importantly, because I can drive right up to a manhole, wherever it is, and vacuum blockage material from the sewer, we don’t have to send in a confined space team which is a major safety boost. Off-road Training Specialist Mark Stopps, of Explore the Country, near Milton Keynes, who led the training, said: “The 8×8 jet vac is a very impressive piece of machinery.